Attendee on-line registration is open. Click on the link below, follow the instructions, and have your credit card ready. Registration fee for LAP members, non-members, and guests: $350. Registration fee for retired LAP members only, and who are not otherwise employed by any company, union organization, or treatment resource: $175. The Greater Detroit & Tri-State Chapters scheduled their LAP 2019 Spring Conference for Monday, May 6 to Wednesday, May 8, 2019. All 50 exhibitor tables are sold. If you would like to list in case a table becomes available, please contact Isidore November at 619-246-4211 or isidorewnovember@hotmail.com. See the attached PDF for complete exhibitor/vendor information. When: Sunday, July 14, 2019 through Thursday, July 18, 2019. Where: Tropicana Hotel, 3801 Las Vegas Boulevard South, Las Vegas, Nevada 89109. 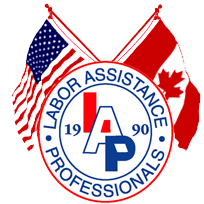 Hotel room reservations are open for the 2019 26th Annual Labor Assistance Professionals Conference, Sunday, July 14 through Thursday, July 18, 2019. We have a dedicated on-line reservations link with the Tropicana Hotel. Please use this link when reserving a room. Mickey Diamond was a member of the LAP New York City chapter and an early pioneer in the development of union-based occupational alcohol programs in the workplace. The LAP organization honors him each year with a presentation of the "Mickey Diamond" award to a deserving LAP member at the summer conference. To contact your state and congressional representatives, text your mailing address zip code to 1-520-200-2223. You will receive a return text listing state and congressional contact phone numbers for your location. Just tap on the number to call.